Tens of thousands of people have died in the conflict between Maoist guerrillas and the Indian state. Alpa Shah lived among the tribal villagers in their guerrilla strongholds for a year and a half to understand why they shunned democracy to take up arms. Eyelids heavy, I struggled to keep my eyes open as we marched in single file, weaving our way across the open rice fields towards the safety of the forest, without even the light of a torch to guide us. I was walking with a platoon of India's Maoist guerrillas - armed rebels who say they are fighting for the rights of tribal people and the rural poor. It was my seventh night of walking with these fighters and we had covered more than 30km (18 miles) each night. They moved after dusk because Indian security forces undertook counter-insurgency patrols in daylight hours. Every muscle in my body was exhausted. My shoulders felt like a dead weight imposing itself on the rest of my body. My legs were numb. My neck jerked as my head collapsed onto my chest. I had dozed off while walking and awoke with a jolt. My brain seemed to empty of all consciousness and awareness moved to my feet, which intuitively put themselves one in front of the other. My neck jerked again, and then again. "Sleepwalking" is what the guerrillas call it. Over the course of the "Nightmarch", I realised they could all do it. For the previous year-and-a-half, I had been living as an anthropologist among India's Adivasis - or tribal people - in a Maoist stronghold in the eastern state of Jharkhand. I wanted to try and understand why some of India's poor had shunned the world's largest democracy and taken up arms to fight for a fairer society. It was only when I was nearly done with my research - in February 2010 - that I unexpectedly stumbled onto the march. Soon, I would return to London but these men would continue with their relentlessly gruelling life. Year after year, they would be constantly on the move as they try to evade security forces. And they would never sleep under the same trees for more than a few days. For the last 50 years, Maoist guerrillas have been fighting against the Indian state to establish a communist society - the conflict has so far claimed at least 40,000 lives. They are better known as Naxalites, named after the village of Naxalbari in eastern India, where a violent left-wing uprising occurred in 1967. Although it was eventually quashed, Maoists have since regrouped and asserted control over vast swathes of central and eastern India. The movement is made up of Marxist ideologues from well-to-do families and poor, lower-caste and tribal combatants, all of whom seek to overthrow what they say is a "semi-feudal" system. But the Indian government considers them a "terrorist" group. Back in 2010, we were moving from one underground guerrilla conference in the jungles of Bihar state to another in Jharkhand state. Although a far cry from the dazzling skyscrapers and shopping malls that tower over Indian cities, the camps erected for these conferences were impressive for their grandeur and impermanence. Trails connected by rainbow bunting led to tents - there were rooms for the combatants, a conference room, a medical tent, a tailor's tent, a "computer room" and a kitchen. There were also cubicles with latrine pits even though there were no toilets in the surrounding villages. These secret cities could be dismantled in a couple of hours, leaving no trace that could be detected by the untrained eye. Life in the guerrilla armies was meant to be devoid of the social hierarchies entrenched in Indian society, creating a casteless, classless microcosm of the utopian community they were fighting for. Material differences were to be erased, gender hierarchies eliminated and the division between mental and manual labour broken down. Individuals became "Comrades" and were reborn with new names that were stripped of caste and class. Cooking rotas involved both men and women; and while lower-level cadres learnt to read, leaders dug latrine pits. But over the years, these Maoists have been reduced to a ragtag army, desperately trying to survive while focusing on their military strategy at the expense of fighting for social justice. Today, the guerrilla strongholds are surrounded by team of Indian security forces with names such as Jharkhand Jaguars, COBRA and Greyhounds - they have all been trained in jungle warfare to fight the guerrillas using their own tactics. Human rights activists allege that the counterinsurgency operations also aim to clear the region of its tribal inhabitants so that the government and private corporations can extract lucrative minerals - coal, iron ore, bauxite. Mining contracts and other licenses have been granted to several domestic and multinational companies. But historic laws that protect the forests and tribal lands stand in their way. The guerrillas try to defend their territory with guns stolen from the police and rudimentary land mines, which are laid under dirt tracks to deter security forces. They use flash devices from cameras to make detonators and cow urine to makes explosives. But they are down to less than 10,000 soldiers and they are facing the might of the Indian government's security apparatus. So their movements are increasingly strangled. Roads are being built and power cables are being installed in India's tribal hinterlands which, for decades after independence, had only dirt tracks and no electricity. The new infrastructure will ease the entry and movement of security forces. The circumstances are ripe for the formation of renegades, betraying and corrupting the insurgents from within. 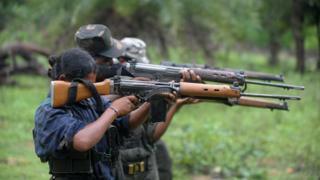 In the last six years, 6,000 so-called Naxalites have surrendered, according to the South Asia Terrorist Portal. But human rights activists have said that many of them are Adivasi tribals who were allegedly coerced by the police. In Jharkhand alone, 4,000 Adivasis who were charged for being Naxalites, have been in prison for years on end without trial. Many of the guerrillas I met have since been arrested or killed. But the Naxalite movement has survived against all odds, resurfacing each time the state assumed it had been snuffed out.